Knowledge Base support case for Likno Web Modal Windows Builder, abstracted and stripped of all user’s private info. I've purchased another 3 domain modal setups. I've completed the modal menus as required and it works fine on my computer but not on line. It says this will only work on my computer, but not on-line only with an I.P. Number address and I need to purchase an update (which I've already just done) before starting the project. First, thank you for your purchase. You need to Activate your Likno Web Modal Windows Builder with the updated license. 1. Install Likno Web Modal Windows Builder (the latest version). 2. Open Likno Web Modal Windows Builder. 3. Go to Help -> Enter Activation Code. 4. Copy the Installation ID and switch back to your likno user area. 5. Go to Likno Web Modal Windows Builder -> Get Activation Code. 6. Select the updated license, paste the Installation ID you copied and click "Give me the Activation Code". 7. Switch back to Likno Web Modal Windows Builder and paste the Activation Code. 8. Click "Activate" and you are ready to go. This way you will have the latest version of Likno Web Modal Windows Builder with the updated license activated and with your allocated domain updated. So, then you need to open your modal window project and compile it. 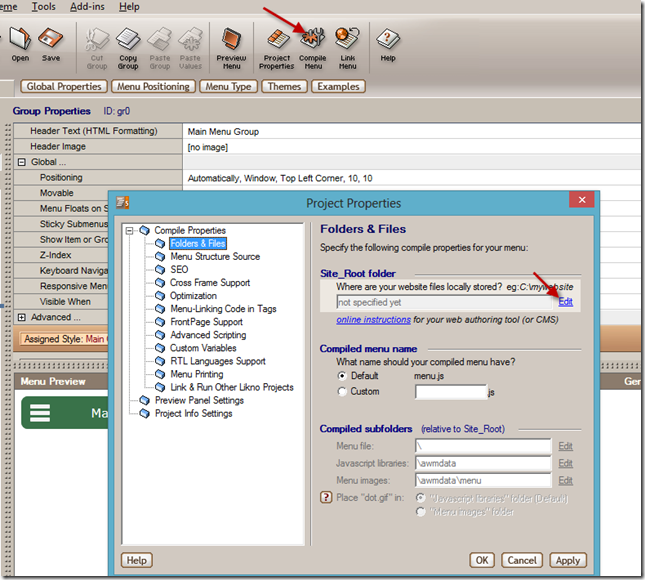 While you are in the Project Properties window choose to compile the project for your allocated domain. Please, let me know if I can be of further help. Movie 'John Wick: Chapter 2' was released in February 8, 2017 in genre Thriller. Chad Stahelski was directed this movie and starring by Keanu Reeves. This movie tell story about John Wick is forced out of retirement by a former associate looking to seize control of a shadowy international assassins’ guild. Bound by a blood oath to aid him, Wick travels to Rome and does battle against some of the world’s most dangerous killers. June 2nd, 2014AWM: Can I see the menu in localhost before upload them to the server? Knowledge Base support case for AllWebMenus Pro, abstracted and stripped of all user’s private info. Can allwebmenus be set up to work on my local computer so I can see the output before uploading the files to my web server? First, thank you for your interest in our Likno products. AllWebMenus is a desktop application so you can compile your menus locally and link them to any local pages you wish (and therefore see them locally before uploading). Note that you need to have an activated license to do so because the trial version does not allow for a compilation. Please let me know If I can be of further help. 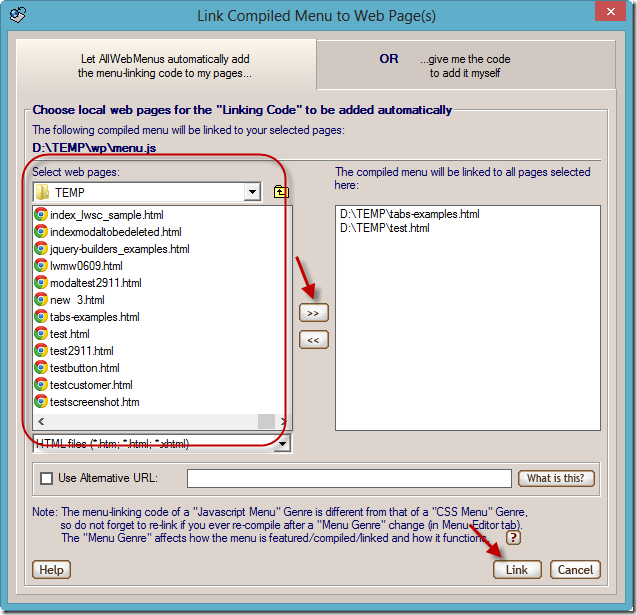 May 24th, 2014AWM: How can I link a menu to the page? Knowledge Base support case for AllWebMenus, abstracted and stripped of all user’s private info. I have created my menu, but I am not sure how to link it to my pages. Step 2: You will be prompted to Link your menu to the pages you wanted it to appear. You select the pages from the left pane and by clicking the right arrows you move those pages to the right pane. This means that in those pages you will link your menu. When you are finished with selecting the pages click on Link. If you still don't see the menu in your pages, you need to check the positioning settings, as you may have positioned it relative to an element or an image that does not exist in your page yet. April 29th, 2014AWM: What do I need to do to update my menus with the latest version of AllWebMenus Pro? Before renewing I'd like to know if I can simply install the new version of AllWebMenus and compile my "old" menu without making changes. Reason is - the menu function I have (Version 5.2 - Build 814) is sufficient for my needs, but the menu doesn't show in IE9 without going into compatibility mode (works fine with Firefox). But I don't want to have to work the menu totally over, since it is pretty large. - See there if your Update Plan has expired or not. If "expired" then click the "Renew" link and renew your Update Plan. - Download the current Version (Build) ( http://www.likno.com/download.html ) and install it. - Open your old project file (.awm) in AllWebMenus, re-compile it and then upload the new menu files (along with the "awmdata" folder) to your website. Note that you may need to delete your browser’s Temporary Internet Files (or cache files) before refreshing the page in order to see the menu. Is there also a program/update that AllWebMenus will work with Safari or similar browsers on iPhone/Smart Phones? The latest version of AllWebMenus that you will be able to download and install, fully supports all the latest browsers (including Safari) and Smartphones (including iPhone). So, all the menus produced by AllWebMenus will be visible and will be working as expected in all browsers in PCs, Tablets and Smartphones. Note that in AllWebMenus you can also create responsive menus. You can create up to 4 versions that your menu can have appearing in different screen sizes.